GEN. LUCIUS A. BARBOUR, of Hartford, president of the Willimantic Linen Co., and one of the prominent men of Connecticut, is a descendant on both sides from families who have been conspicuous in the history of New England for over two and a half centuries. Gen. Barbour on his paternal side is in the eighth generation from Thomas Barber, the emigrant ancestor, the line of his descent being through Lieut. Thomas, Samuel, John, John (2), John (3), and Lucius Barbour; and on his maternal side he is in the ninth generation from Robert Day, one of the original proprietors of Hartford, the line of his descent being through Thomas, Samuel, Josiah, Gideon, Ambrose, Albert and Harriet Louise Day. (I) Thomas Barber (spelled Barber. Barber, Barbar, and Barbour, as variously written, through the probate records; the spelling Barbour was adopted by Henry, of this branch of the family), the first of the name in New England, came to Windsor, Conn., in 1635, at the age of twenty-one, with the Saltonstall party, under Francis Stiles. He was a soldier from Windsor in the Pequot fight, and is mentioned in Mason's narrative. he married Oct. 7, 1640, and died Sept. 11, 1062. His wife, Jane, died Sept. 10, 1662. (II) Lieut. Thomas Barber, son of Thomas, born July 14, 1644, married Dec. 13, 1660, Mary Phelps, born March 2, 1644, daughter of William Phelps, the emigrant, of Windsor, and his second wife, Mary (Dover). He removed to Simsbury, where he built the first meeting-house. He died May 10, 1713. She died in 1687. (III) Samuel Barber, son of Lieut. Thomas, born May 17, 1673, married Dec. 17, 1712, Sarah, Holcomb, born in 1691, daughter of Nathaniel Holcomb and Mary (Bliss). He died Dec. 18, 1725, and she died in 1787, at the age of ninety-six. She removed from the old parish to West Simsbury in. 1738 with her four sons, Samuel, Thomas, Jonathan and John, and her daughters, Mercy and Sarah, the sons settling on the best lands in the Center School District. This family were among the earliest and most conspicuous settlers of West Simsbury. (IV) John Barber, son of Samuel, born Dec. 4, 1719, married Jan. 22, 1746-47, Lydia Reed, born Nov. 18, 1726, daughter of Jacob Reed and Mary (Hill). He died in 1799, and his widow died in 1806. (V) John Barber (2), son of John, born Nov. 29, 1749, married in 1773 Elizabeth Case, born April 20, 1752, daughter of Capt. Josiah Case and Esther (Higley). He died Nov. 3, 1825. She died May 26, 1817. (VI) John Barbour (3), son of John, born Feb. 18, 1782, married (first) Oct. 13, 1803, Delight Griswold Case, born Oct. 15, 1783, daughter of Elisha Case and Delight (Griswold). She died April 13, 1811, and he married (second) June 15, 1812, Fanny Hunt, born Aug. 30, 1792, daughter of George Hunt and Jemima (Hollister). He died Nov. 24, 1865, Mrs. Barbcur on Nov. 6, 1858. (VII) Lucius Barbour, son of John (3), born July 26, 1805, in Canton, Conn., married April 23, 1840, Harriet Louise Day, born Feb. 2, 1821, daughter of Deacon Albert Day and Harriet (Chapin). He died Feb. 10, 1873, she on Sept. 26, 1886. When about twelve or fourteen years of age he accompanied his parents to Western New York, on their removal to that State. For a number of years succeeding his majority he was traveling in the South and West, where he was engaged in business and investing in Western land, particularly in the State of Indiana. He finally located in Madison, Ind., of our city, and a man so positive in every sphere of and engaged in the wholesale dry-goods business. Subsequently he became interested in similar business at Cincinnati, Ohio. Along in the middle 'forties he removed to Hartford, Conn., and ever afterward made that city his home, yet as a silent partner retained his interests in the business houses at Madison and Cincinnati. He possessed excellent business habits and ability, and in his undertakings prospered greatly. He was an upright man and a Christian gentleman, and was greatly esteemed and respected by the community in which he lived. He was a deacon in the Second Congregational Church of Hartford from 1858 to 1865, and in the First Church of the same denomination and city from 1869 until his death. He was a trustee of the Congregational Seminary; and a director of the American Asylum for the Deaf and Dumb, and of the Charter Oak Bank. Lucius A. Barbour, son of Lucius Barbour, and the subject proper of this sketch, was born Jan. 26, 1846, at Madison, Ind., and in infancy was brought to Hartford, Conn., by his parents, on their return to that city. Here his youth was passed in attendance in the public schools of the city, he being graduated from the high school in 1864. Later he became teller in the Charter Oak Bank, holding the position until 1870, when he resigned for the purpose of a contemplated two years' tour of travel in Europe. From boyhood young Barbour evinced a taste for military affairs, and it is perhaps in this line that he has been the most widely known throughout the State and New England. However, his business career has been equally brilliant. He enlisted Sept. 9, 1865, becoming a private in the Hartford City Guard, then attached to the First Regiment as Battery D. His military advancements were rapid, and received wide notice in the State, and he proved himself worthy of the promotions, his instincts and tastes entitling him to military leadership from the outset. He resigned from the Guard in 1871, but returned some years later, when, in February, 1875, he was chosen major of the First Regiment. He was elected lieutenant-colonel Dec. 29, 1876, and on June 26, 1878, was advanced to the command of the regiment. Col. Barbour was in command of the First at the Yorktown Centennial in 1881, and won a national reputation by the splendid efficiency and discipline which his organization displayed. In connection with the Yorktown Centennial the command visited Charleston, S. C., and gained the highest military praise. Archibald Forbes, the celebrated London war correspondent, paid a high tribute to Col. Barbour's command. The Colonel was one of the most popular officers connected with the National Guard, and his selection later as adutant-general of the State met with universal satisfaction throughout Connecticut. He resigned the colonelcy of the First Nov. 12, 1884. His political affiliations have been with the Republican party. He was a member of the House of Representatives in 1879, serving as the colleague of the late Hon. 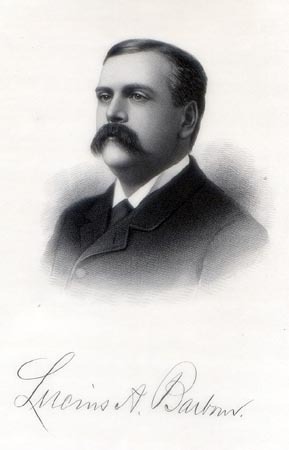 Henry C. Robinson, and his legislative career was in keeping with the course which he had followed in other callings of life, and added to his reputation and popularity. Gen. Barbour was prominently identified with Battle Flag Day, being a member of the legislative committee which had the arrangements in charge. As a distinguished representative of the National Guard the General is honored throughout Connecticut. Since 1884 he has been treasurer and president of the Willimantic Linen Co. of the city whose name it bears. He has the reputation of being one of the ablest business managers in the Capitol City. His religious connections are with the First Congregational Church of Hartford. On Feb. 8, 1877, at Brooklyn, N. Y., Gen. Barbour was married to Miss Harriet E., born Dec. 2, 1849, daughter of Alfred Smith Barnes and Harriet Elizabeth (Burr), Mr. Barnes being of the well-known publishing house of A. S. Barnes & Co., of New York City. Mrs. Barbour died at Hartford, Conn., Nov. 8, 1899, universally beloved and lamented. Her children are: Lucius Barnes, of Yale College, class of 1900; and Harriet Burr. (I) Robert Day came to Boston from Ipswich, County of Suffolk, England, in the "Elizabeth," in 1634, and became one of the original proprietors of Hartford, Conn. He married Editha Stebbins. (II) Thomas Day, son of Robert, the immigrant, married Oct. 27, 1659, Sarah Cooper, daughter of Lieut. Thomas Cooper, who was killed by the Indians at the burning of Springfield, Mass. He removed to Springfield, Mass., in 1658, and was the ancestor of the Day family in that State. (III) Samuel Day, son of Thomas, born in 1671, married in 1697 Mary (Marah) Dumbleton, daughter of John Dumbleton and Lydia (Leonard). (IV) Josiah Day, son of Samuel, born in 1701, married in 1731 Elizabeth Bliss, daughter of Peletiah Bliss and Elizabeth (Hitchcock), and resided in West Springfield, Massachusetts. (V) Gideon Day, son of Josiah, born in 1733, married in 1762 Elizabeth Duncan, daughter of Samuel Duncan and Sarah (Ingram). They resided in West Springfield, and later removed to Westfield, Massachusetts. (VI) Ambrose Day, son of Gideon, born in 1767, married in 1791 Mary Ely, daughter of Nathan Ely and Silence (Morgan). (VII) Albert Day, son of Ambrose, born in 1797, married in 1819 Harriet Chapin, daughter of Frederick Chapin and Roxalany (Lamb), of Chicopee. Mr. Day was a prominent business man of Hartford, of the firm of A. & C. Day, and Day, Griswold & Co. He was a brother of the late Calvin Day. He was lieutenant-governor of Connecticut, 1856-57. His children, besides Mrs. Lucius Barbour, were: Albert F. and Charles G.